The most recent additions to this page will be at the top of the appropriate topic. We are starting to receive a number of e-mails requesting information about vehicles other than AN121, which we cannot (usually) answer. This is NOT a complaint from us - we are very pleased that so many of you are visiting our Web Site! In view of the requests which we cannot answer, this page will start to display such questions (once permission has been sought from the author), allowing them to be shared with a much wider audience. It is hoped that this method will result in answers being found much quicker than at present. KC Jacobs from California, like most of us would love to win the lottery! Thinking positively(! ), when he does, he would like to purchase a London double-decker bus, in need of a new engine and transmission so that he can have a more locally serviceable USA made drive system. Can anybody advise where INTERIOR information can be obtained? He would like photographs and especially measurements. Ward Jones Commercial Vehicles Ltd of High Wycombe has a Leyland Atlantean Engine & Gearbox available for offers of between £1K - £1.5K. For further details, please phone (01494) 711510 and ask for Steve. 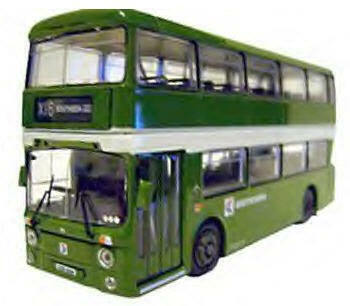 John and myself are extremely pleased that what should have been the first Atlantean model issued (based on the many internal and external photographs taken at Cobham in 2006), AN121 will finally be available in miniature form from around 31st January 2009 (original estimate was 31st October 2008!) and thank Britbus for what looks to be a splendid model. The finished article displays "370 Tilbury Asda Store" and has running plates for GY18. 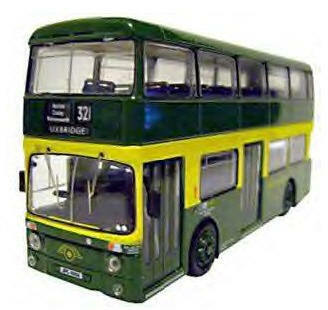 The model has black wheels instead of the dark green and an offside London Country North East fleetname, which AN85, AN132 and AN257 amongst earlier painted examples had, but AN121, one of the later batch to be painted didn't have this because of some longer advertisements obscuring this. The nearside engine cowling has also gained a grille, which the AN68 chassis ANs didn't have with London Country, though when sold to other bus companies, they could be seen in all manner of guises, when worn out cowlings etc were replaced with those made available when earlier ANs started to be scrapped! It's also interesting that downstairs has grey window rubbers, with black used upstairs except for the front window, however the real thing may have to sport black window rubbers once these are replaced due to availability. It would have been nice to see "370 GRAYS" used and BLUE seats, but it has to be said the detail is superb and we're delighted with the model and full credit to whoever at Britbus spotted our message about "300 STEVENAGE" being incorrect! Please note, that despite offers of assistance and contact via this web site, nobody from Britbus checked with us to confirm small details such as moquette colour, livery colour, the direction the staircase should run or indeed the best destination blind to be used (which in the LCNE livery should be 370 GRAYS - the only service which the bus operated prior to being demoted to training duties in September 1988). You will notice from the images on the "Home Page" that the Mayflower Green looks faded on the model (like the full sized one! ), though this is a pre-production model, it is doubtful this will change on the main run. Celestra moquette has no traces of orange in it and would have looked better blue, as depicted on the first LCBS model AN2-01 (AN65 - JPL165K). We've already received 3 e-mails from people "complaining" of our recommendations and ruining the authenticity of the model, hence this message being posted! If we can purchase a supply of these models at a discounted price, the intention is to make some available depicting "370 GRAYS" and blue seats. We'll advise developments regarding this, though the earliest they'd be available would be at Cobham in 2009. If you would like to add your name to a waiting list and help us judge demand (if any! ), please send us an e-mail using the link in the "Contact Us page. Britbus should be applauded with regard to how much detail has been captured and applied to the model and remember that whilst AN121 was a trainer at Stevenage, she could have been used on any service, including a short 300, but her destination glass was panelled over, so an A4 sheet of paper would have appeared in the windscreen. When stored at SV after the initial purchase in March 1989, she was plated up for service TWICE amongst SOVEREIGN's 12 other single door ANs, but drivers couldn't work out how to get in - because she was secured!!! Of course, in LCBS days, it wasn't uncommon for ANs minus engines to be plated up when the Engineering Department was responsible for the morning run out!!! COBHAM Rally at Longcross test track - first reasonable distance covered since major repairs! AN121 ran extremely well to and from the rally and we managed to purchase a speedometer sender. She did run hot, but the thermostat was damaged thanks to the hot running caused when the fan drive bolts broke last year. Once the new thermostat and speedometer sender have been fitted, we hope to have a long hassle free period, so we can once again try to save up for her long awaited respray! Rather than miss a rally thanks to a faulty speedometer, we used a portable GPS device to accurately record our speed travelling to and from the rally. Hopefully we can return to traditional methods for RUSHDEN on 6th May, from her new home! This message is from John Copping and Chris Wall to ALL preserved bus and coach owners! If you don't have one already, make sure you carry at least an 8 ft length of chain and a padlock on your bus with your spares! Our fan drive bolts sheared on the way to the petrol station on 20th August 2006. This has caused a lot of mechanical damage to the bus, but to get her home, we used the chain and wrapped around the radiator in order to keep the fan drive away from causing further damage. The chain was previously used for securing TL13 (TPC113X - which we owned back in 1992) and has always been on AN121 ever since and came in useful when the exhaust almost fell off back in 1993! Thanks to the damage caused to our accelerator cable and the difficulty we are having obtaining one for our chassis type, we cannot attend 2006's Duxford or Canvey Island Rallies. On the way home from Southsea on Sunday 8th June 2003 (28 miles into the 122 mile journey home - an hour and 5 minutes into the 3 and three quarter hour journey), the "hook" which holds the nearside engine canopy open for maintenance purposes managed to become entangled with the three drive belts and completely destroyed two belts and badly damaged the one remaining. The first we knew of a problem was our alternator light illuminating. Naturally we stopped as soon as it was safe to do so (at Liphook Services on the A3 at 18:20). Toward the end of the buses' service life, she only used to run with ONE of the three belts (typical London Country maintenance!) and the first thing we did was to run her with the correct number. We never thought this sort of thing could occur, so we didn't carry any spare drive belts with us. Fortunately, we were able to adjust the alternator position and despite there being big chunks out of the one remaining belt, both of us managed to match all of the gearchanges 100% on the way home and we arrived home safely at 21:50, when the alternator light illuminated again as we parked up! Despite us disconnecting this hook from the canopy and carrying this in the bus - in future, we will ALWAYS carry a spare belt. Our bus is serviced every two years irrespective of mileage. Although costly, this has ensured the bus has been reliable for us. Sunday 8th June 2003 demonstrated to us that unexpected situations CAN arise irrespective of how well you maintain your vehicle. We thought we had made allowances for most situations in our 14 years with AN121! Please learn from our experience and always carry spare belts and a few gallons of water with your preserved vehicle, you'll be glad you did. And we thank our extremely special bus for getting us home again! Britbus (by Asian bus) Model Atlanteans - with the proper type Park Royal body!!! Nobody knows why it has taken so long, but at last one of the model bus companies has finally produced a model of LCBS type Leyland Atlanteans. From the pictures, the mirrors look a little on the large side, but it's been such a long wait, we'll forgive them! Chris has reviewed these models, click here for details and further pictures of the models.